More Goodies from Japan and a few from Ebay US. This was another package that made it to my doorstep in unbelievable time. Just a tad bit over 2 days (50 hours) from the time it was accepted at the Japan Post Office until it reached my door this morning.....Priceless. Hotwheels Speed Readerz car like Ucwepn has that shows a digital readout of how fast (in scale I think) a car goes and can be used (like Ucwepn did) to measure how fast a train motor goes. A Motorized Terrence that I am going to try to do a deface modification to. A Tomica Chemical Tanker Truck. I have really wanted the rarer blue cab & chassis one but so far have to settle on this more easily found one. Bachmann Hot Dog Stand just couldn't resist it. Wish they made one between the HO and 'O' Scale versions that they have but I will settle for this. 6 Tomica Town Street Lights, Always thought these were neat but whenever they came up for auction they garnered lots of attention and went quite high in the bidding. Got lucky with this set of 6 and the button batteries came with it too. 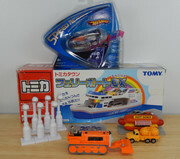 Tomica Car Ferry is pretty neat and I thought it would be good for the Tomica Car Future World Collection. This can still be bought new on Ebay here in the States but I sure didn't want tp spend hundreds on one. This one was used in the Japan auctions and nobody wanted to bid against me so I got lucky for 1000yen. Whats neat, is they never put the stickers on so I can wash the whole thing and they add the original stickers which were included in the box. Below is an unboxing video. Up next various items, the need things I keep everything else on its way to Ebay. The very hard to find, Grey Brick Risers. I have a couple of these now and they go great with all the grey track that we use. Brand New Plarail Expo Coaches and a couple more to complete the sets we have now. Aqua & Yellow, Orange & Green. Last is something I didn't buy that must have been added by one of the sellers as a gift. Its a huge, Heavy vinyl Play Mat stamped 1989 Tomy. Its a whopping 69" x 36" I wasn't expecting this. Its very well made on the thick vinyl. I have no use for it but I need to check with Japamart to make sure they didn't make a mistake and put this in my box when it was someone elses. If its not a mistake then I will either offer it to BPT member free for the cost of shipping or put it on Ebay. Oh wow, what a nice haul! The car ferry, the streetlights and the Expo coaches are all especially cool. Nice Haul Super. I'm alao getting some more auctions in the mail soon as well. does the boat actually float on water? I don't think so but I will try it when I do the washing. The front opens up that might let water in along with the wheel slots on the bottom. Stickers wouldn't last too long either. Plus, if a child took it to the beach and opened up the ramps, all the vehicles would go straight to the bottom of the Lake. There are several Tomica variations of the Ferry boat so maybe one is floatable.